The Ram-Rod Fishing Rod Holder with Double Socket Arm and 2.5 Inch Round Base is the world's most adjustable fishing rod holder. 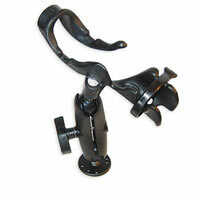 Made from high strength plastic and marine grade aluminum with a dual-ball and a fully articulating arm. A remarkably well made and unbelievably well thought out fishing rod holder, the Ram Mount Rod Holder adjusts vertically, horizontally and swivels 360¬?. Because of its funky looking design, it'll hold Ocean, Spinning and Fly Rods. The Ram-Rod Fishing Rod Holder is perfect for kayak fishing.